Google always put the focus for Web Designer on producing interactive ads. And while the tool offers a number of ad-centric features, there is nothing that would stop you from using it to develop any other kind of content, as well. If you want to build ads with Web Designer, though, the new version now features a significantly deeper integration with that service, too. You can now publish your creations directly to DoubleClick Studio, for example, and those ads are automatically tagged with the right account, advertiser and campaign information. Google’s AdWords service for advertisers now also supports HTML5 ad creatives from Web Designer. This marks the first time AdWords can handle HTML5 ads. Google also says that Flash ads that are uploaded to Adwords will be automatically converted to HTML5 now, too. While that’s great for advertisers, other users will likely appreciate the addition of a number of new animation tools to Web Designer more. The team reworked the animation timeline in the tools to now include features like animation scrubbing, timeline events and auto keyframing, which should make it quite a bit easier to build animations inside the tool. The team also added a few new 3D features, which should make the animations more interesting, too. 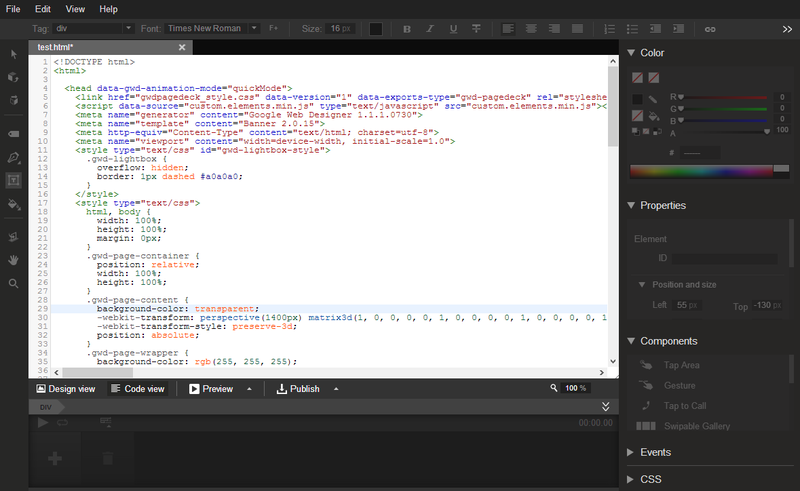 Other new features include an integration with Google Drive to make it easier to share Web Designer files with others, as well as integration with the CodeMirror text editor. On the more technical side, the team rewrote each component in the application as a web component. This includes things like galleries, maps and YouTube embeds.